Sede legale: MI -I TRASPORTI IN GENERE, IL MAGAZZINAGGIO MERCI NONCHE' IL O I TRASLOCHI IN GENERE . 262-MERIDIONAL TRASPORTI DI DOMENICO LUCENTE - S.R.L. 263-CORRIERI ESPRESSI RIUNITI S.N.C. DI BERNUCCI ARISTIDE & C.
265-CO.RE.F. 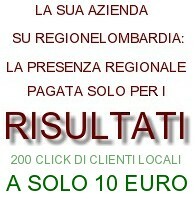 COOPERATIVA REGIONALE FACCHINI S.R.L. Sede legale: MI -FACCHINAGGIO E TRASPORTI PER CONTO TERZI. Sede legale: MI -FACCHINAGGIO E TRASPORTI PER CONTO TERZI LA SOCIETA' POTRA' COMPIERE TUTTE LE OPERAZIONI NECESSARIE PER IL RAGGIUNGIMENTO DELLO SCOPO SOCIALE. Sede legale: MI -AUTOTRASPORTI MERCI PER CONTO TERZI.